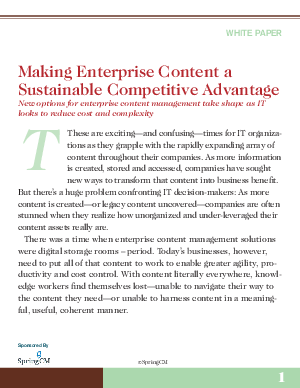 This report covers three of the leading options companies look at today when considering enterprise content management software solutions, document sharing and collaboration and workflow applications. These are Microsoft SharePoint, OpenText and SpringCM the only enterprise-class cloud ECM provider. Each offers different strengths and takes different approaches to providing the functionality IT organizations are looking to imbue throughout their companies. These companies' different philosophies about how they present their ECM platforms to customers create important questions for IT decision-makers looking to match their resources and strategic direction with the right ECM technology solution.